Melia Studios located at Agii Apostoli, Kato Daratso area. 4 km away of Chania city centre to the west on the road Chania – Platanias – Kissamos. Some information on how to find us: Driving out from Chania to Pllatanias, Kissamos at 4 km from city center turn right from traffic lights to nearby Nearxou str. and then 400 meter on the rights is located Melia Studios. 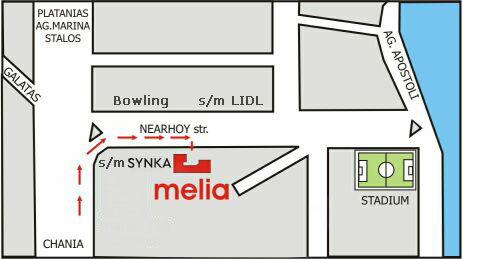 The bus station to Melia Studios is at city center of Chania on the “Square 1866”. Beach Photos of Agii Apostoloi!